Home Uncategorized You are not a failure. You are a winner! Beloved Child, If you think you have failed me, think again. 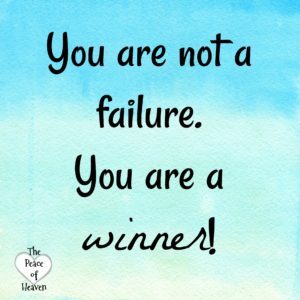 You are not a failure. On the contrary, you are a winner! You were created in my image and I create perfection. Do not let the enemy make you think otherwise. Be patient with yourself as I am patient with you. Be loving to yourself as I am loving to you. Be kind to yourself as I am kind to you. Cast off those negative thoughts that bring you down by simply talking to me about it first. Then release those thoughts to me. I will replace your negative thoughts with thoughts of goodness and transform the way you think about yourself and life in general. This is possible through me. Even if you are in a place of dissatisfaction with your life, you are not stuck. You are never stuck because I am with you. I will carry you to a place of freedom. Do not only rely on yourself but rely on me. Lean on me. I am here for you. Always.